"I always think there's a band, kid." 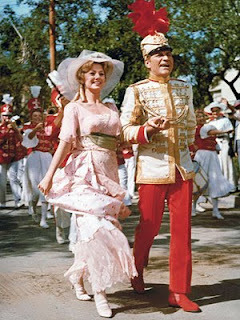 Director Morton Da Costa's 1962 screen version of Meredith Willson's stunningly successful Broadway play The Music Man is one of the screen's most joyful musicals. Preserved for audiences is Robert Preston's Tony winning role of "Professor" Harold Hill. It's a colourful, brash homage to small towns, quirky characters and the love of music. It's a fun, touching and inspiring movie. I know that my many viewings as a youngster inspired my love of musical theatre. Above all it is a very funny movie, and that makes it a fun movie to watch. Paul Ford as Mayor Shinn gives a master class in the art of scene stealing. Hermione Gingold as Mrs. Shinn is every bit his equal. The script adapted by Marion Hargrove is sly without stooping to condescension. There are pleasures and delights around every corner of River City, Iowa circa 1912. The production was nominated for 5 technical Emmy awards. It was filmed in Ontario, Canada. 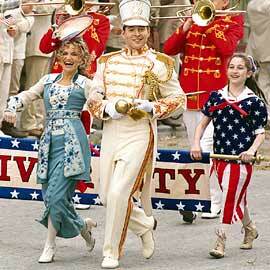 In 2003 the Disney corporation retooled the classic as a "Music Man for the 21st Century". It didn't work. It should have worked. It's The Music Man. Two Broadway musical veterans led the cast, but Matthew Broderick was woefully lacklustre in the role of a vibrant con man and lovely, adorable Kristen Chenowith came off as a psycho spinster, perhaps compensating for Broderick's lack of spark. Mayor Shinn in the hands of adaptor Sally Robinson and the usually reliable Victor Garber was not in the least funny. He became a cardboard cutout villain. "I've never been to the footbridge with a man in my life." The worst offense was messing with my favourite line of the original. You will recall that Harold has lured Marian to the footbridge because he has "come up through the ranks in this skirmish and he's not resigning without his commission". Harold's compatriot Marcellus (Buddy Hackett) needs to get the romantic rogue's attention because "a crazy anvil salesman has been running all over town spilling the beans". 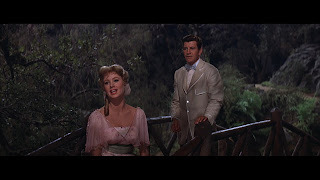 Heeding Marcellus' beckon, Harold turns to Marian and explains he is "expecting a telegram from (pause, still playing the game, what would impress this gal?) Rudy Friml", implying a close relationship with the famous composer. It's subtle and funny. It always makes me smile. For some reason, in the TV movie Harold says he's expecting a telegram from "Hector Berlioz". Not even Hec Berlioz, but Hector Berlioz who passed away in 1869. Perhaps, unbeknownst to the audience, Marian was a devotee of spiritualism and would be duly impressed with Harold's influence. If so, it was too subtle for me. I adore this movie! It was my first bluray, one reason being I had given away my DVD to a young friend. Must spread the word! You are so right about the remake. I could only stand about 5 minutes of it. If I don't remind myself Matthew Broderick also did "Biloxi Blues", I could still be very upset with him. Thanks for another great movie blog! I agree, MissMcC., it's best to focus on "Biloxi Blues" when the mind wanders to Mr. Broderick. I don't mind remakes, it's alawys interesting to see what other people will do with the same material. I agree with your assessment of the newer version, though. It didn't have that sense of fun so delightful in the original. Sometimes I think we've lost the ability to interpret pure and simple comedy. I liked Chenoweth's stronger interpretation (as the original Broaway Marian, Barbara Cook once pointed out, the character was not an innocent ingenue but a spinster disappointed in what she saw around her). Come to think of it, even though I liked Shirley Jones in the role very much, it would have been fun to have Cook's performance on film. While we can listen to Ms. Cook on the original cast album, those old original cast albums are both tantalizing and frustrating. It's wonderful to hear the original performances, but how grand it would be to see them! I saw a wonderful production of The Music Man in the eighties starring Tony Randall. Road companies, summer stock and community theatres have filled a lot of seats because of this terrific show. I've never seen the remake. I think you and I both have some friends in smaller roles and while I'd like to see their performances, I didn't want to mess with my memories of the original. Also, that line change makes NO sense. What the eff? I think Matthew Broderick is a great performer and I loved him in THE PRODUCERS, but I can not see anyone in the role but Robert Preston. Do you know when they were casting the movie, they also considered Dan Dailey or Bing Crosby. Robert Preston is the Music Man! 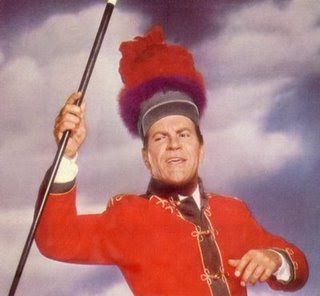 I remember reading Cary Grant was considered for the role and it was he who pushed for Robert Preston.